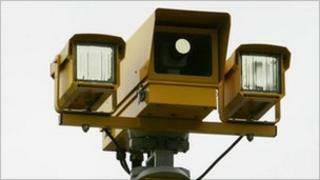 Average speed check cameras on lampposts could be used to catch speeding drivers in Avon and Somerset. Fixed speed cameras across the region are being axed after councils reduced their contributions to their road safety budgets and speed enforcement. It could potentially leave some areas without any speed cameras. But e-mails obtained by the BBC show discussions have taken place about average speed check cameras replacing fixed cameras. Avon and Somerset Police are due to take over running the mobile speed cameras from April after the majority of council funding was axed. Many fixed cameras across Bristol, Bath and Somerset could be turned off because of the funding cut. The suggestion of using the cameras was made at a meeting in late-February and came to light following a Freedom of Information Act request by the BBC. Derek Baillie, who was helping to finish work recommended in a report by Deloittes, told Terry Bullock, traffic manager at Bristol City Council, about the discussion with Safety Camera Partnership chairman Laurie Lewis. In the e-mail Mr Baille said: "He [Mr Lewis] wants to put ANPR [automatic number plate recognition] cameras up - in pairs - on lighting columns and link them to a system for average speed measurement. "So, in return for allowing the police to use your lighting columns you might get some speed enforcement." In return for allowing the police to use your lighting columns you might get some speed enforcement. Mr Baille added he asked Mr Lewis to submit a written proposal for the scheme. Mr Bullock, from Bristol City Council, replied: "I am happy with the principle of using lamp columns for this purpose." He added that many of the city's cameras were already ANPR-capable but some of the city centre ones would not be suitable for speed enforcement. "However we do have a series of cameras on some of our quality bus corridors [the 'showcase' bus routes] which may be more suitable," he added. A spokeswoman for Avon and Somerset Police said it did not wish to comment about the possible use of average speed check cameras. It also added Mr Lewis did not want to discuss the matter. South Gloucestershire Council said the use of the cameras were a police initiative and there had been no formal approach. A Bristol City Council spokesman said it was aware of the plan to use ANPR cameras to regulate speed in the city. "There has been no formal approach by the police and one would need to come from them," he added. "The likelihood may be that only arterial roads, such as the Portway, would be feasible."